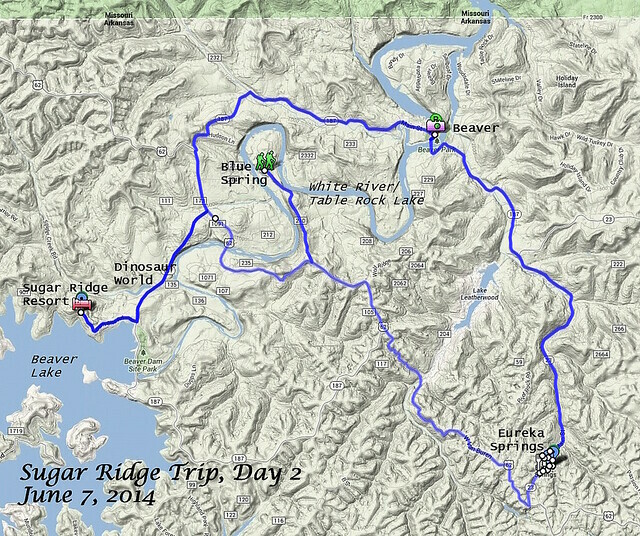 We awoke on Sugar Ridge to light rain and wind moving in from the south across the lake. After the shower ended, we watched a sailboat out on the lake below and saw the Belle of the Ozarks out on its morning tour. We saw cardinals out back and I ventured out front of our cabin to photograph the demon dogs guarding the left and right sides of an entry gate to an adjacent building under construction. We then drove over to the peninsula on the White River/Table Rock Lake to walk at Blue Spring; I had toured this attraction on my own a month earlier. We watched the entire historical video and then made our way down the hill to the gazebo and over to the spring. 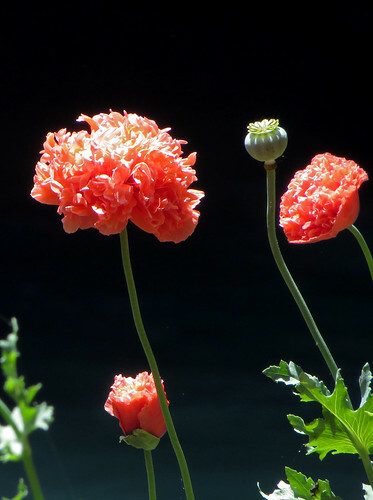 We walked about the grounds, admiring the poppies and other flowers and noting busy bees and ladybugs. We crossed the dam, looking back at the gazebo and also down at the spill. My Canon SX260 HS camera, which has survived some rough use, would no longer fully open its lens cover, so I either had to manually press it all of the way open or accept a masked shot, such as one I took of the dam. We wound our way around the grounds and then returned to Wendy’s Xanadu, which needed gasoline. So we drove over to Eureka Springs to fill up the car and then ourselves, seeking lunch at the Local Flavors Cafe. We parked in one of the public lots downtown, noticing some nice paintings and photographs on the art wall in front of us. We parked directly in front of a print of Edward Robison’s gigapan of Inspiration Point, and also liked Wild Wings by Randy Rust and Ozark Creek Downtown by Janet Goodyear. We enjoyed sandwiches at the Local Flavor Cafe, which I have eaten at several times over the years. Then we walked through town, climbing the stairs at the Basin Park Hotel to see the ballroom up top. We made our way up Spring Street to Harding Park (aka Sweet Swing Park) but Wendy was very thirsty and there were no watering holes in the area. So we circled about until we found Chelsea’s Bar for a free cup of water, both feeling rather out of place in that dark and boozy place on a sunny afternoon. We circled back around to the small park, where as a small child I would climb the stairways by Sweet Spring and walk up on top of the hill and down the other side to Harding Spring. We could not get a photo at the stairs, since a group of hipsters were busily taking photos there, but we did make the climb. Up top we passed a tree with long exposed roots and were surprised to see a deer up top at the far end of the unpaved Kansas Street. Wendy spotted a red mushroom on the short trail down to Harding Spring. We browsed the storefronts along the various streets, stopping for treats at the Rocky Mountain Chocolate Factory (no, we were nowhere near the Rockies). We enjoyed them at Basin Spring Park, where a group of drummers gathers on the first Saturday of each month. I made a video of the event from ground level and also from above when Wendy and I climbed the stairs to the ridge above the basin. 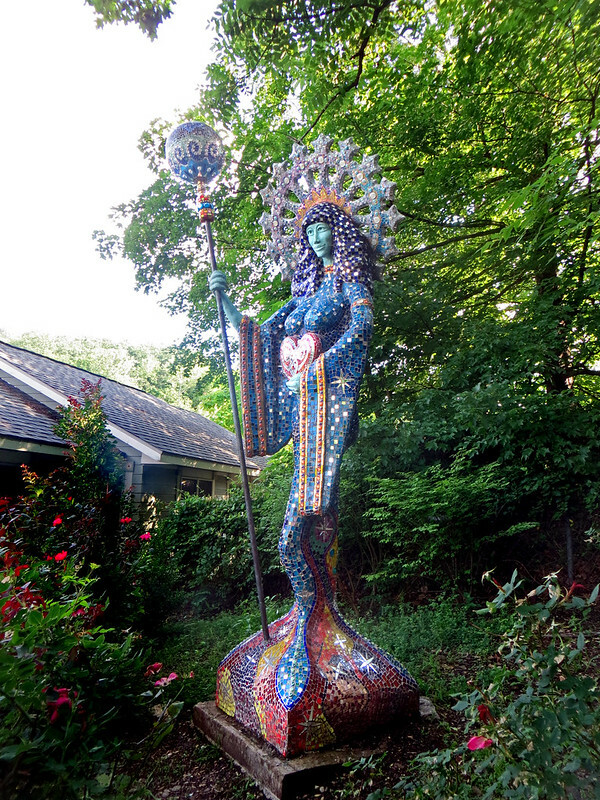 During our climb we giggled at the, er, vitality of the statue of Aza (which stands for Adora Zerlina Astra, or “Beloved One Created of the Stars”) which was created by Bruce Anderson. We wrapped up our afternoon in Eureka Springs with a walk up Center Street and then down one of the long stairways to Main Street. While returning to our car, we noticed Humpty Dumpty doing his thing. Like Aza, he was commissioned by Dan and Belinda Harriman. 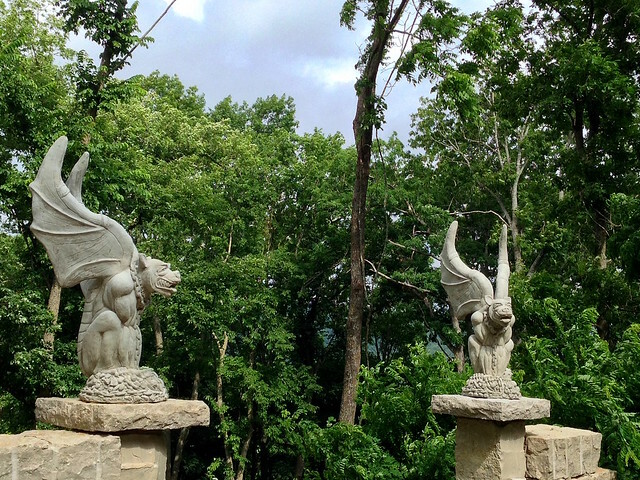 Their additions to downtown Eureka Springs certainly brought this pair of visitors some smiles. We left town driving north on Arkansas 23, the route my parents and I used to take back when they had a cabin 14 highway miles to the north on Table Rock Lake. 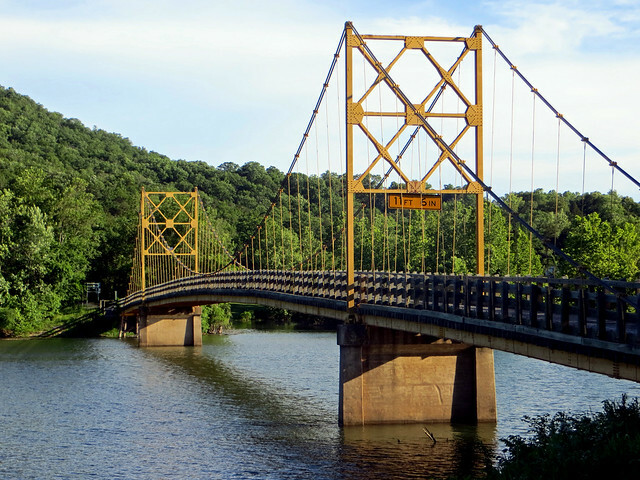 We diverted onto highway 187 so that I could drive us over the one-lane wood-deck suspension bridge at Beaver, Arkansas, which locals term “The Little Golden Gate” and “The Bridge to Nostalgia”. It was fun to see her reaction to this anachronistic structure, which seems older but was actually built in 1949. We stopped to take photos and Wendy quickly spotted one of her favorite things: rose bushes, which a rather obvious sign distinguished from wildflowers. Making our way back to Sugar Ridge, we passed the Farwell’s still-operating Spider Creek Resort and their less successful Dinosaur World. The appalling statues there were created by the same guy who did the Christ of the Ozarks, which explains a lot. We didn’t trespass, but we did get a shot of the old spider out front and some of the decaying creatures. It remains a weird sight to drive along 187 and see very odd-looking anatomically-incorrect dinosaurs looming about the hillside. We ended our day with hot dogs at the cabin on Sugar Ridge, relaxing on the deck as we contemplated what we might do on the next and final day of this extended weekend.